AVAILABLE NOW! 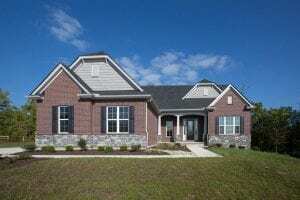 The Catalina – This beautiful 4 bedroom, 3.5 bath home sits on a .708 acre cul-de-sac homesite and offers hardwood floors, 9 ft. ceilings, crown molding, spacious main level master with adjoining luxury bath and large walk-in closet. The great room with stone fireplace opens to the gourmet kitchen with granite countertops, island and bar, stainless steel appliances and breakfast area. Walkout to a large covered deck overlooking the gorgeous wooded view. N. 747 to R. Kyles Station, L. Lesourdsville-WC at roundabout, L. Woodview Way.